2018 Topps Series 2 Baseball is the jelly to Series 1’s peanut butter. The checklist picks up from where the first set left off, filling in gaps and expanding things along the way. This is true for not just the main set, but many of the inserts as well. But that doesn’t mean new elements aren’t added to the checklist. 2018 Topps Series 2 Baseball hobby boxes once again come with either an autograph or a relic. Hobby jumbo boxes have the trifecta of one autograph, one memorabilia card and one manufactured relic. 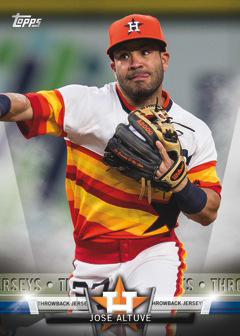 The main 2018 Topps Series 2 Baseball set includes another 350 cards plus a pair of short prints for 352 total cards. It continues on from Series 1, doubling the flagship set’s checklist and bringing it to 702 total cards. Veterans not included in the first release appear along with several rookies and young stars. Among the rookies is Shohei Ohtani. Gleyber Torres and Ronald Acuna are both short print variations. Like other variations, they do not have parallels. As usual, parallels are plentiful. Hobby and hobby jumbo boxes have a dozen different versions on their own. They start with Rainbow Foil (1:10 hobby packs) and Gold (/2018). The rainbow continues with Negative, Vintage Stock (/99), Independence Day (/76), Black (/67),Father’s Day Powder Blue (/50), Mother’s Day Pink (/50), Memorial Day Camo (/25), Clear (/10), Printing Plates and Platinum (1/1). Of these, some are exclusives. Negative and Black parallels are only in hobby and hobby jumbo packs. Clear cards continue to be hobby-only (regular, not jumbo). First, the returning stuff. 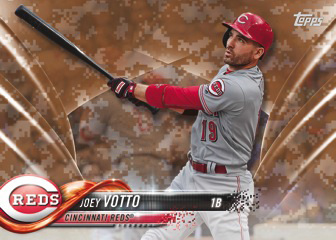 Topps Salute is back as one of the largest insert sets in 2018 Topps Series 2. Coming in with 100 new cards, these come with several themes. These include throwback uniforms, retired legends, big plays and standout moments from the batter’s box. Topps Salute cards fall 1:4 hobby packs. The 1983 Topps Baseball tribute continues on as well. Inserted 1:4 hobby packs, Series 2 cards center on rookies and All-Stars. While the design comes from 35 years earlier, the checklist uses current players. 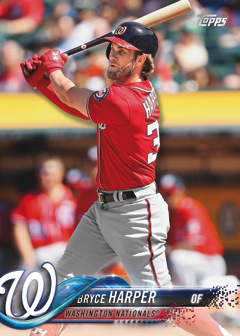 2018 Topps Series 2 Baseball has a couple of new debuting insert sets as well. Instant Impact has 50 cards, all of which spotlight players’ breakthrough seasons. 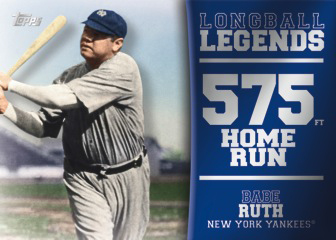 As the name suggests, Longball Legends (1:8 hobby packs) is all about home run hitters. Regular inserts all have multiple tiers of parallels in Series 2: Blue, Black (/299), Gold (/50), Red (/10), and Platinum (1/1). Scarce Sketch Cards feature original artwork of top stars. Given their unique nature, they’re all considered to be one-of-a-kind. Many of the 2018 Topps Series 2 Baseball hits are premium versions of more common inserts. 1983 Topps Baseball, Topps Salute (/99 or less) Autographs fall under this category. In addition to base autograph versions, both of these have Red (/25 or less) and Platinum (1/1) parallels. 1983 Topps Baseball Autographs also have Black (/99 or less) and Gold (/50 or less). In a similar vein, Longball Legends and Instant Impact have both relic and autographed relic versions including Red (/25 or less) and Platinum (1/1) versions. Topps Reverence Autograph Patch cards return, bringing a high-end take to the flagship brand along with a checklist of top stars. Available only in hobby and hobby jumbo packs, these also have Red (/5) and Platinum (1/1) parallels. Major League Material brings a lot of scope to both basic relics and signed ones — not to mention their multiple parallel levels. Own the Name Relics return. Only in hobby and hobby jumbo, these one-of-one memorabilia cards have a full letter from a jersey nameplate. Hobby packs have a couple types of manufactured relics. Topps Team MVP Medallions select the top player from each club, put them on a commemorative coin that’s embedded in a card. MLB All-Star Game Logo Patch cards feature 30 former All-Stars. Patches match the logo of the game they participated in. Both have Gold (/50), Red (/10) and Platinum (1/1) parallels. Select players have autographs numbered to 10.